Kirstjen Michele Nielsen is an American attorney and national security expert serving as the sixth and current United States Secretary of Homeland Security since 2017. She has been a driving force in president Trump's campaign of deporting the illegal immigrants from the country. As Secretary of Homeland Security, Kirstjen Nielsen is helping in defending the Donald Trump administration’s actions, which have been immensely criticized by some. Well, technically she is the reason behind many family separations that we've been seeing over the last few months. And this has some people wondering about Nielsen’s own family. Is she married? Does she have a husband or children? So let's dig into the mystery about her love life in the article below! Kirstjen Nielson's Relationship Status: Is She Married? The 46-year-old Kirstjen Nielsen is not married nor she was ever reported to have been. The lady was always devoted to her duties towards the homeland department, so much that not even in her prime she was alleged to have had a spark of romance. Nielsen only gave a handful of names when it comes to the revelation about the people who she considers to be her closed ones. And so we can see that, she had no name for the man of her life. A year after her sworn, in April of 2018, Nielsen attended the white house for a state dinner party with Chad Wolf, Chief of Staff for the Department of Homeland Security (DHS). As soon as they were seen side by side on the entrance, the trade publishers were almost ready to call them a hot new hook-up from the presidential house, with some even gossiping about a secret wedding. 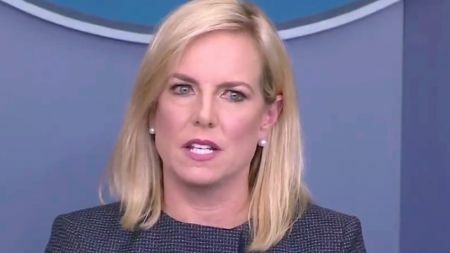 Later when people asked Nielsen about that very incident, the secretary couldn't help but laughed it off by explaining Wolf is her subordinate and was just escorting a lady to her seat. Back in Jan 2018, people still had the odds of knowing the what-about of Nielson's husband. As per the protocol, the white house requires its staff to fill up the name in the Spousal Section in the Public Financial Disclosure Report. Officials like Nielsen are required to disclose their financial sources of income in the disclosure with the income sources of their spouses as well. However, Kirstjen wrote “none” in the section of the form that asked for Spouse’s Employment Assets & Income and Retirement Accounts. While she may be quite innocently secretive with her personal life given at least she is not involved in any marital drama whatsoever, the story, though on her professional life differs far more than that. As soon as trump held the presidential crown, he started all those banishments and deportation things which he was long promising to do. Added to that his frontrunner in this somewhat tyrannical act became none other than Kirstjen Nielson, herself. This chief from the Homeland Department, became the face of the Trump administration's controversial "zero tolerance" immigration policy, making her a divisive figure in the process. 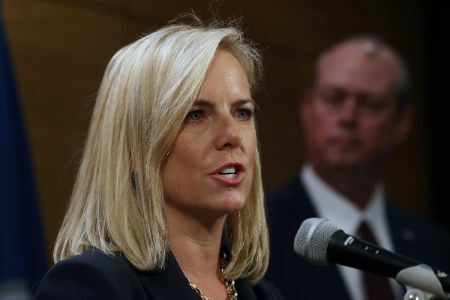 Criticism swirled around Nielsen when she further went on to claim the policy was not the factor for separating migrant families at the US-Mexico border, especially after she defended the detainment of migrant children who'd been taken from their parents or guardians. Since the Trump administration, roughly 2,000 migrant children have been separated from their families. 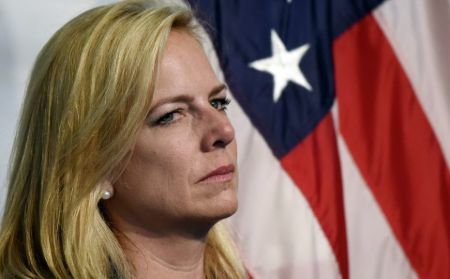 However, Nielsen assured the public that these children are being well taken care of, but that hasn't stopped protesters from berating her over the Trump administration's immigration policies — and urging for her resignation. Similarly, in the month of June 2018 Trump, too signed an executive order claiming it would end the separation of children from their parents or guardians at the border. But immigration lawyers, among others, still continued to criticize the language of the order and argued that it will still offer the federal government a wide option for separating families. Nielsen was born on May 14, 1972, in Colorado Springs, Colorado, U.S.
Nielsen is an alumnus from Georgetown University (BS) and University of Virginia (JD) as well. Nielsen is the daughter of Phyllis Michele Nielsen and James McHenry Nielsen, both United States Army physicians later who is of Danish ancestry while her mother is of Italian descent. Nielsen's net worth stands at around $1 million.